Elvis Presley was the most important and successful artist of the 20th century. He was also the most mismanaged, mismarketed and mishandled. Perhaps nowhere is this sad fact more grossly apparent than in the immediate years following his untimely passing at the age of 42 in 1977. As they had done throughout his career his record company RCA failed to know what exactly to do with the recorded legacy of Elvis Presley in the days, months and finally years following his death. As during his life, RCA and Colonel Tom Parker failed to recognize just how truly important and valuable Presley's musical contributions were and less than a year after his death they were putting out insulting and head-scratching releases like Elvis Sings For Kids and Grownups Too. Even potentially valuable projects, focusing on unreleased material, like the Our Memories of Elvis collections were soiled by cheap artwork and a general lack of vision. It's hard to imagine any other major artist being treated quite as shabbily as Elvis Presley was in the years after his death with perhaps the worst offence being 1981's Guitar Man, a countrified 'remix' album that destroyed some of his greatest American Sound Recordings of 1969. At times it seemed like RCA had nothing but disdain for their top selling artist and these shoddy releases, combined with the release of Albert Goldman's near criminal posthumous assignation biography Elvis, unfairly damaged Elvis Presley's reputation for years to come. 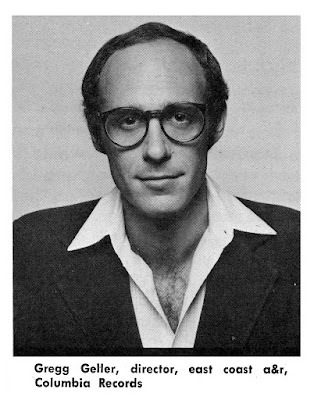 Ironically the surprise savior waiting in the wings was a man whose name was more synonymous with Costello than Presley when he arrived to change the tide in the mid eighties. "My job at RCA was to be the head of A&R, but after hearing me complain about the generally poor quality of the label’s Elvis releases in the years following his death, my boss, Jose Menendez, said to me, in effect: “if you’re so smart, why don’t you do something about it?” So I did." Geller recognized that Elvis Presley was far from just the guaranteed cash cow that most of the executives at RCA saw him as, and knew there was not only a market for unreleased archival recordings but also a need to put some of his past mishandled releases in proper perspective. Geller's first step towards reestablishing Presley as the force of sonic nature that he had been was the 1984 six record set A Golden Celebration, a massive collection of mostly unreleased material that would set in motion the more well-known and acclaimed Ernst Jorgenson archival releases of the nineties and beyond. A Golden Celebration was a solid hit in the days when box sets were viewed as more of a novelty than anything else and the stage was set for a series of startling releases for Elvis' 50th. Geller's concept of how to rescue Elvis Presley's recorded legacy is so obvious in hindsight that it's almost ridiculous that it took nearly ten years for RCA to capitalize on it. Geller's plan was a deceptively simple one: Release a series of 'concept' albums made up of almost entirely of previously released material each designed to introduce a different side of the once and future king to a whole new generation...and to a whole new format, the Compact Disc. Starting in late 1984 and throughout 1985, Geller would present 4 sides of Elvis Presley to new and established fans: The ferocious rocker, the raw bluesman, the balladeer and the heartbroken deep soul singer. 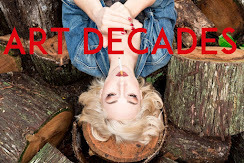 These 4 releases would successfully began to shift the conversation back to where it belonged, namely the music and would help lead the way to the legendary Jorgensen releases and finally Elvis 30 #1 Hits. The first release Rocker landed in late 1984 and focused almost entirely on tracks from 1956, with a couple from '57 thrown in for good searing measure. Opening with "Jailhouse Rock" and closing with "Hound Dog" the compilation was a perfect introduction to the frenzied recordings that blew apart the fifties and American popular culture in general. 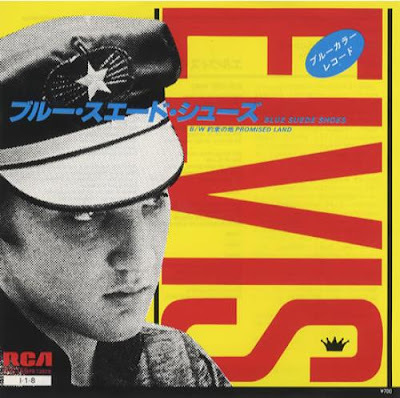 The back to basics album, featuring an iconic photo of Presley channeling Brando in The Wild One, sold much better than RCA expected and most surprisingly landed Elvis in heavy rotation on the exploding MTV via the ready to go "(You're So Square) Baby I Don't Care" clip from Jailhouse Rock. 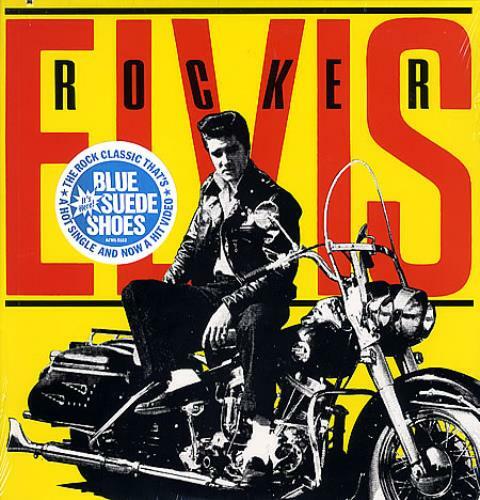 After nearly a decade of botched releases Rocker was a swift kick in the face to critics and fans who had forgotten the genius of Elvis Presley and it set the stage for the next three releases Geller had in mind. If Rocker had a fault it was in its perhaps necessary obviousness. Geller's follow-up collection, focusing on Elvis' greatest love songs, A Valentine Gift For You was the more surprising album and it is in many ways a more rewarding listen. 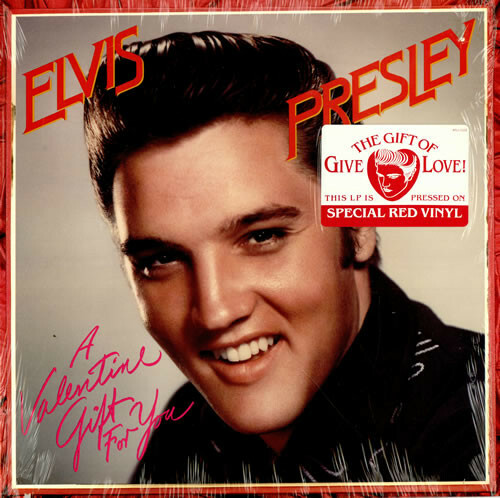 Expertly mixing some of the most moving performances Presley gave in the fifties and sixties, the pressed on red vinyl A Valentine Gift For You is equal parts haunting and lovely. While the album is filled with some of the most beloved Elvis hits it is the lesser known tracks like his stunning near six minute Bob Dylan cover "Tomorrow is a Long Time" that would have the biggest impact on fans new to Elvis' remarkably deep back catalog back in 1985. If A Valentine Gift For You sounded surprising to many ears in the mid-eighties then its follow-up Reconsider Baby was a downright shocking experience. 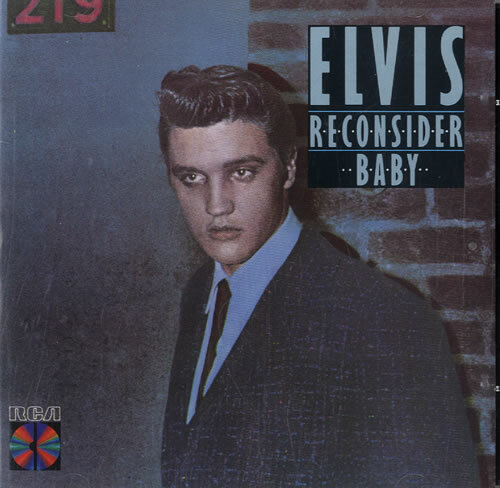 One of the great Elvis Presley albums, Reconsider Baby would prove to be the weakest seller of the Geller releases but it remains the most justifiably acclaimed. Focusing mostly on recordings Elvis made in the sixties, when he was supposedly just recording poor quality soundtrack recordings, Reconsider Baby still packs a major wallop. From the jaw-dropping opening title track to the smoldering epic unedited closer "Merry Christmas Baby", Reconsider Baby is one of the great albums of the eighties and its relatively obscure status today is downright tragic. 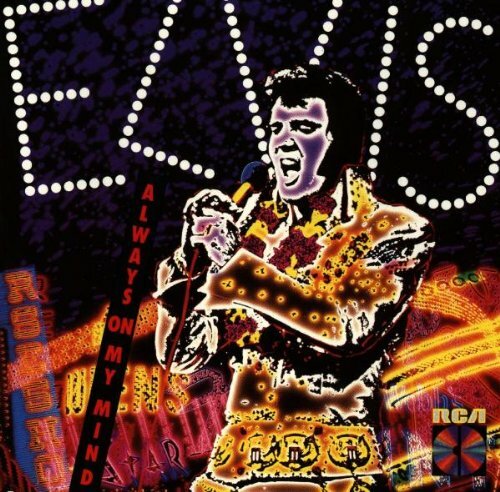 Few albums in Elvis' discography are quite so ideally sequenced and perfectly thought out. With its eerie cover photo and masterful Peter Guralnick liner notes, Reconsider Baby was exactly the kind of grand slam project that RCA should have been putting out in the years leading up to its release. It's one of the definitive Elvis Presley albums and had it been the only release Geller supervised in this period it would have been enough. The final 50th anniversary release of 1985 is fittingly enough Always on My Mind, an exquisite collection focused on some of the most evocative tracks Elvis recorded in the seventies (save for "Don't Cry Daddy" from the sixties). Pressed on purple vinyl and again expertly chosen and sequenced, the album remains one of the most devastating in Elvis' canon and represents an ideal entryway into his most complex and controversial period of recording music. If the music Elvis recorded in the seventies was his most autobiographical then Always on My Mind is its most important chapter. It's a heartbreaking listen focused on isolation, depression, divorce and rage and is as far away from the jump suited caricature that Elvis in the seventies is often portrayed as. It's the sound of a great artist at his peak and on the edge. Gregg Geller remains one of the most unheralded figures in the history of Elvis Presley's music. His work would turn things around at the most pivotal point possible and would help lead the way to the phenomenal archival work that continues to this day through the Follow That Dream label. 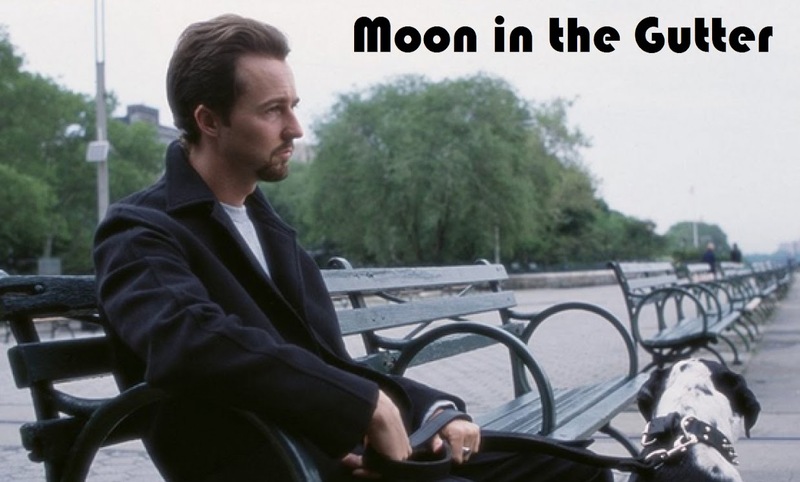 We should all be grateful to Geller for actually giving a damn about the legacy of one of our great artists. Music lovers everywhere owe him a great debt.